Dentin Hypersensitivity, most frequently referred to as “sensitive teeth,” is one of the most common complaints that dentists deal with on a regular basis with their patients. Hot drinks like coffee, cold beverages, and ice cream are often the most common culprits for affecting sensitive teeth. People will feel a painful, sharp reaction from the consumption of these foods and drinks, often times unbearable. The good news is that, for most patients, the pain of sensitive teeth can be eased. The teeth are covered by a hard layer of enamel, and their roots are protected by what is known as the cementum. Both the enamel and the cementum protect the inner layer of the tooth called the dentin layer. This layer is made up of microscopic tubules that are full of nerve endings and are incredibly sensitive. Whenever the tooth’s enamel does not fully cover the dentin layer, hot or cold foods and beverages (as well as that cool air that the dental hygienist blows on your teeth) can cause short, sharp sensations of pain. Tooth sensitivity should never be ignored, and it should be brought to your dentist’s attention. 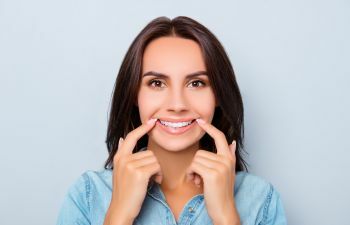 While there are some cases of extreme dental concerns, most cases of sensitive teeth can be treated and reversed with minimally invasive methods. The most common first step is for patients to begin using toothpaste that is specifically for sensitive teeth. Toothpastes for sensitive teeth contain ingredients that block off the nerve endings of the tubules in the dentin layer. In order for patients to receive maximum benefit, these toothpastes should be used for at least a month. If you are whitening your teeth at home, it will be advised that you take a break from bleaching until your teeth are no longer extremely sensitive. If receding gums are causing your teeth to be extra sensitive, it will most often be advised that patients use a very soft, pulsing toothbrush (e.g. Sonicare) so that the gums will heal and grow back into their proper places. At Gold Hill Dentistry, we are here to serve our patients and ensure that they have the most optimal oral health. If you are suffering from sensitive teeth, please do not continue to suffer alone. Let us help you find the relief you need.